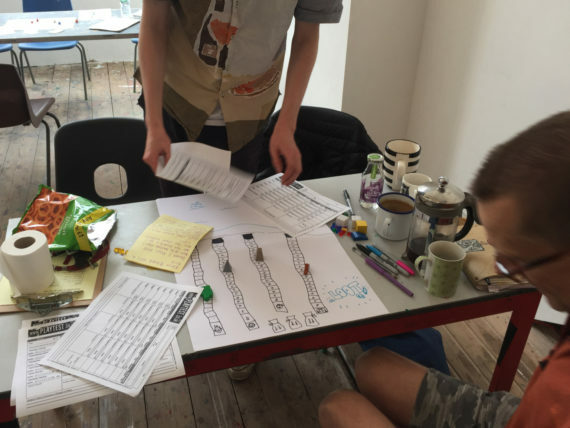 2018 a-n artist bursary blog about my research into gaming and the subterranean. An attempt to learn how to make screen-based underground narratives. My aim with the a-n bursary I received was to build an imaginary subterranean location as a basis for an art work which in its most basic form is both open-ended and critically interesting for the player to explore. The question soon arose as to what extent I should guide that experience within the game structure. I wrote in my last blog how I attempted to map out this subterranean landscape through designing a text-based computer game. The third blog in this series is about the different game formats and design possibilities I explored in preparation for making this virtual landscape. 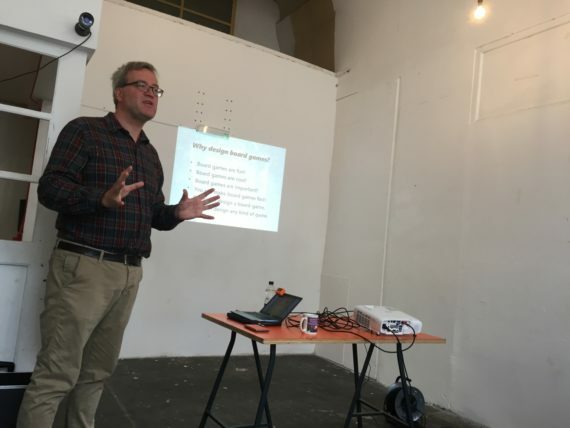 To start thinking about this I organised two public workshops around game design, both which were held at Open School East in Margate this October. 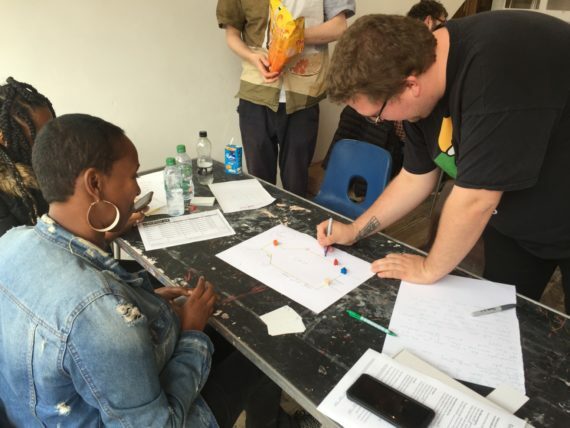 The first workshop was a ‘Masterclass in Tabletop Game Design’ with James Wallis from games consultancy Spaaace. The workshop started off with an introductory lecture which took us through the history of board games from the ancient Egyptians’ play habits to chess to modern board games such as Monopoly and Settlers of Catan, before we moved on to game mechanics and the basic structures used to design board games. James started off with a quote by Sid Meier, the creator of Civilisations: “A Game is a series of interesting decisions’. I felt this pointed to the crux of my questions about the discipline in relationship to art and the hierarchy of who makes those decisions – how does a viewer become an active player and how does one design an experience so that their actions contribute towards its outcome? 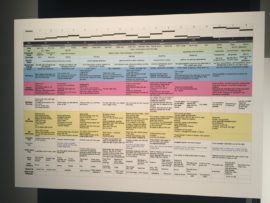 The traditional mode of experiencing art is comprised of a viewer surveying what is essentially a set ‘of interesting decisions’ made by the artist. But to what extent can the viewers themselves be drawn into this decision making process? This is of course a question that participatory art has been grappling with for decades, but feels particularly pressing in the current political and consumerist climate where the freedom of citizens are being challenged on every front but political apathy is still widespread. Back in the workshop we spoke about what to build a game from; dice, cards, a board, questions and answers, conversations and so on. We also touched upon how to write a good rule book, the amount of chance versus choice in a design and the most random element of all – the players. James spoke about different players types, such as the socialiser, the battle-ready and the explorer. 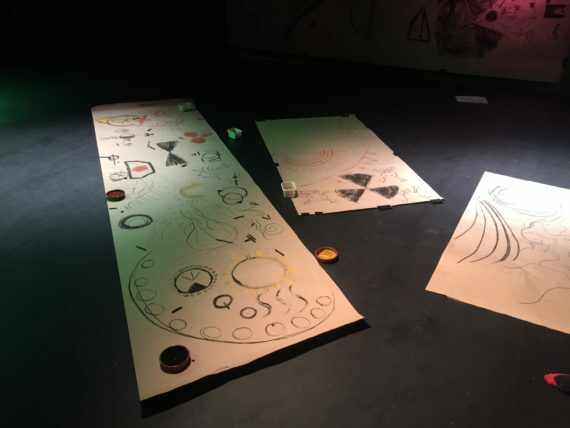 We spoke about “the magic circle”, the temporary world that is created and agreed upon between the people present, a term referenced by both ludic theorist Johan Huizinga and anarchist writer Hakim Bey. Lastly, James spoke about the importance of borrowing ideas from existing games. As an artist it is always refreshing to hear advice that breaks with the myth of the genius and challenges the idea of the supposed tabula rasa that any avant garde emerges from. We then got together in groups and designed a board game in 20 mins which was play tested by the other groups. With the feedback we received we then modified our game and had it play tested a second time. It was really fun to work so quickly and collectively and see that you can come up with a solid foundation for a game in such a short amount of time. Definitely an approach I’d like to bring into my own practice more! For the second gaming workshop we were visited by Lewis from ‘The Escapement’ Escape Rooms in Margate. Escape rooms are physical rooms where a team of people have to escape as quickly as possible by solving a series of puzzles by using their collective wit, imagination and cooperation. Prior to the workshop we were able to try out their escape room experience The Pit, a mining-themed challenge. This was cool as throughout this project I’ve been thinking about the underground mostly in an imaginative sense. Here was the opportunity to see how someone had interpreted the subterranean as a physical space. The Pit differs from The Escapement’s other challenges as it is a series of underground spaces rather than one room and I was almost surprised that our team managed to get out in just over an hour. Time really did fly while we were down there though, it was lots of fun! 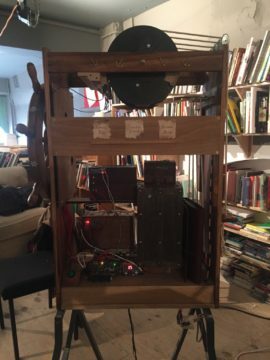 It was especially interesting to think about the difference in the intention between an escape room and the large-scale installation structures of artists such as for example Mike Nelson or Christoph Büchel. The goal is very clearly defined in an Escape Room; “get out as quick as you can”, whereas you could argue that although the intention is often more obscure in an art context this can often lead to the experience being more open to interpretation. On the other hand, the time pressure involved in an escape room brings to the fore personality traits in those taking taking part, which is always interesting to observe. The aim of Lewis’ workshop was to teach us the mechanisms and design decisions behind an escape room. What is a puzzle and how do you design one? How do different player psychologies play into the situation? How important is immersion? The Escapement put a lot of emphasis on using narrative as a driving motivator and a convincing atmosphere through props and scenography, whereas other escape rooms can focus more on the technical aspects of a puzzle solving. We learnt that every item in their escape room is there for a reason. You have to think both creatively and logically when trying to figure out their hidden meaning. Some of the tasks could only be completed with two or more people, bringing cooperation and communication into the game as important aspects. 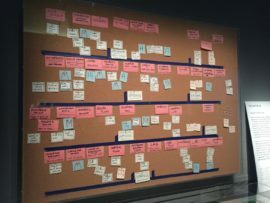 What I took away from the workshop for my own practice was a method to plan and map out a series of causes and effects, keeping in mind having a balance between the type of challenges you present to players. 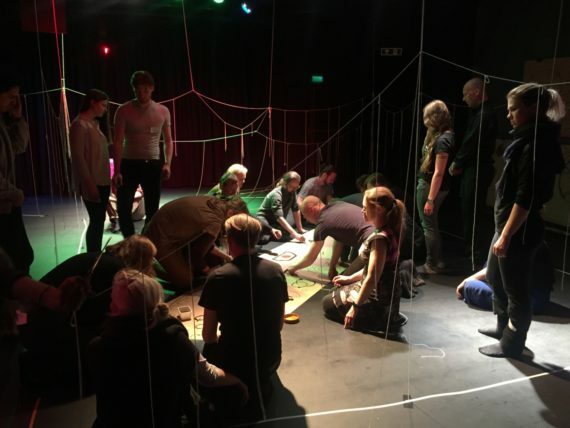 At the same time as I was organising these workshops I was invited by Grenselandet LARP festival in Oslo to run ‘Katabasis’, a Live Action Roleplay I have designed and run with collaborators Francis Patrick Brady and Susan Ploetz. ‘Katabasis’ follows the structure of the Nordic Larp tradition. It starts with a 2hr workshop to familiarise the players with the communication methods (the game is non-verbal), space and interactions that are the structure of the game. They then play out a narrative (not pre-planned) for about 2 hours and spend the last half hour debriefing. Debriefing is an important way to bring players back from their fictional character and the collective magic circle they have created. Designing ‘Katabasis’ (the name references the journey to the underworld) was very much an experiment in using the associations of the subterranean as a location within which to explore culture building in groups. ‘Katabasis’ is a Black Box Larp, meaning that it takes place in a simple room with minimal scenography, props or costume. 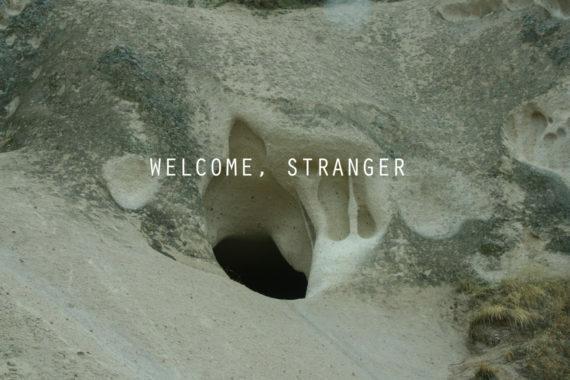 In our latest runs of the Larp we experimented with using string to demarcate cave tunnels, entrances and caverns in game. Players are essentially asked to suspend disbelief in regards to the scenography but still have to bend, crawl and wind their way through the space. This embodiment of the cave space seems to strengthen players’ experience and I am curious as to if a purely screen-based or “mind-based” experience can do the same. I wanted this project to be an exploration of the possibilities and limitations of various game platforms as mediums for art making and narrative building. Thinking aloud now about the most obvious differences between the various gaming traditions. 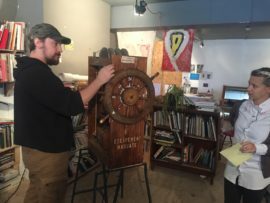 Using the whole body to interact with the task at hand is something Larps have in common with Escape Rooms, as does the spatial design that goes into the overall experience. 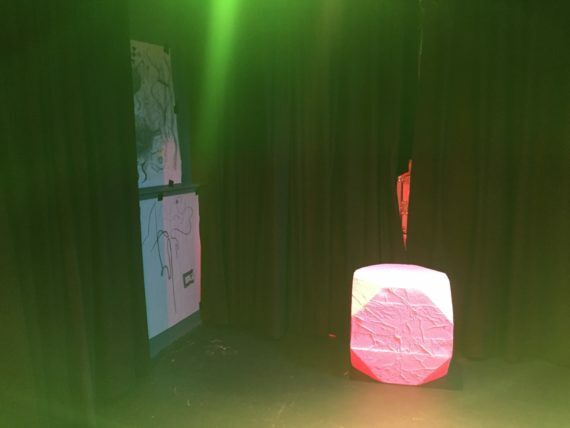 Although Black Box Larps don’t necessarily use scenography they often use sound and light in their design. With Katabasis we use the lack of light to create atmosphere and the sound of water to demarcate different stages of the game. You could say this is similar to the video game experience where the visual and audio plays a large part. Larp is usually predicated on your interaction with other players, which is similar to board games and MMOs (massive multiplayer online games). However, one element that does set it apart from many gaming traditions is that Larp does not tend to have gamification built into its game design. The focus is on creating an experience, such as an atmosphere or emotion, rather than winning a game, something I am interested in translating into single player screen-based games. It is worth mentioning in this context ‘Design/Play/Disrupt’, the video game exhibition the V&A opened this autumn. There are plenty of video games they focus on that do not follow the “traditional” video game trajectory, ‘Journey’ being one of them. ‘Journey’, has in many ways much in common with Larp, apart from the obvious fact that it is screen-based. The aim of the game seems more about exploring your surroundings and interacting with other players and as it happens non verbally and without any textual direction the onus lies very much on the player to create their own interpretation of the events and visuals that unfold as the game space is explored. 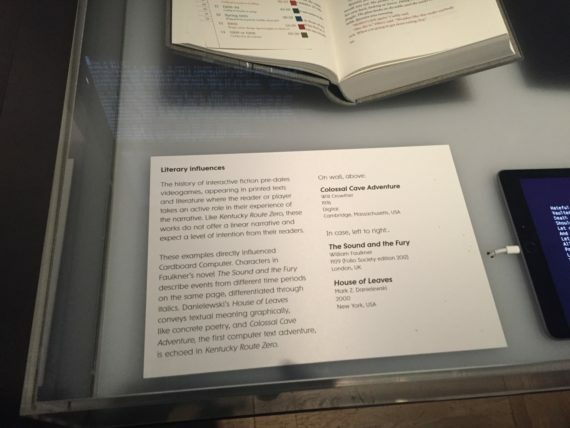 Another thing that was fun to see at the V&A exhibition were all the references to ‘Colossal Cave Adventure’, the original text-based adventure game I wrote about in my first blog. The highly rated video game ‘Kentucky Route Zero’, which is the focus of a section in the exhibition, used this as one of their major inspirations and reference it quite notably in their game design. They also used Twee, a system built on Twine, the interactive fiction programme I used to write my text-based adventure game and referenced in the last blog, to design their game.